One month ago at this time, my dearest friend and I were wrapping up the second interview with Jay Leno for the book club segment of his website, Jay Leno’s Garage. This event marked the culmination of the most amazing two year odyssey in my twenty year adventure as a published author. It began simple enough. A gentleman from California was traveling to Virginia with his son who was scheduled to ship out of Norfolk, their Jeep broke down in Kingman, and they rented a car from the Chrysler dealer. Well, I work the rental counter and the company sells my books through the rental office. http://rcm.amazon.com/e/cm?t=1968adventurer&o=1&p=8&l=bpl&asins=0760319650&fc1=000000&IS2=1&lt1=_blank&m=amazon&lc1=0000FF&bc1=000000&bg1=FFFFFF&f=ifrHe purchased a copy of The Big Book of Car Culture and I signed it. After twenty years of having my work published, including six books, I am used to people praising my work and people accusing me of imitating a writer. However, I am not used to people acting as though they have discovered the next Clark Gable or John Steinbeck and I am definitely not used to people who act as though they will not make it to the bathroom as they wait in line to talk with me. Well, I knew of the store as it is legendary for the diversity of new titles as well as the wide array of vintage books and magazines but had never been there. It was in Burbank and for more than thirty years the line was drawn at Hesperia, I simply refused to engage in high speed automotive battles or attempts to set new records for the shortest distance covered in the greatest amount of time which are the two options on the highways in the L.A. area. Quicker than you can say ten car pile up he had Tina, the owner on the line, and his phone was in my face. We exchanged pleasantries and phone numbers, we discussed the book and the fact she had it on the shelf, and then we said goodbye. End of story, or so I thought. Vintage Maseratii at Auto Books – Aero Books. A few weeks later Tina called and asked if I would be interested in signing books during one of the stores famous informal Saturday morning cruises. Now, this is a store where legendary automotive stars sign books, where Jay Leno picks up his car magazines, and the cars that cruise in on Saturday morning often range from a 1962 Maserati to the latest offering from Ferrari. You can guess what my answer was. At this time I was an associate editor for Cars & Parts magazine with my primary duty being the writing of a monthly column, The Independent Thinker. Shortly before heading to Burbank with the wide eyed wonder of a pair of hillbillies on their first trip to the big city, the editor approved my proposed column profiling Abner Doble, the genius behind the amazing Doble steam powered automobiles. In my initial research I learned Jay leno had recently purchased a Doble roadster that originally had belonged to Howard Hughes. In spite of a half century of living that has crushed my belief in Santa Clause there is still child like wonder and faith. Wouldn’t it be neat if Jay Leno came to the book store when we were there? Woudn’t it be amazing if he drove the Doble that day? Well, we survived the freeway, didn’t even get lost, and had a delightful morning. Enhancing the experience was the sale of a few books. After the signing we wandered through the store looking for a few obscure titles and a couple of magazines that I could use for research. Fueling our reluctance to leave was the hope of catching up with Jay Leno. Around 3:00 we packed it in and decided the time had come to roll west to Santa Monica. Before leaving, I left a signed copy of Cars & Parts magazine and added a note about my assignment to profile Abner Doble. Tina, the owner, promised to give it to Jay the next time he came in. We finished the weekend in grand style with a stay in Santa Monica, exploring the legendary pier at sunset, and then heading for the next assignment, covering the Automobile Driving Museum in El Segundo, the following morning. Imagine my surprise when we arrived home, gathered the mail, checked the phone messages, and discovered Jay had called to thank me for the magazine. Here is the kicker to this part of the story. He stopped by the store less than a half hour after we left. He was driving the Doble. Fast forward to February of this year. 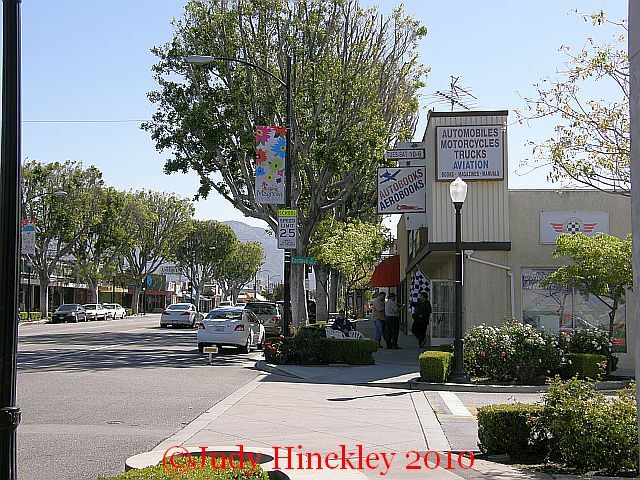 We are now familiar with the store in Burbank as we have had several signings there and have had several more titles published. A rousing and maddening game of phone tag ensued for the next three weeks followed by an invitation to tape an interview about The Big Book of Car Culture for his website. Wow! A book that had suffered embarrassingly anemic sales had caught the attention of Jay Leno! A book that had been awarded the bronze medal at the International Automotive Media Awards and then vanished into obscurity had a new lease on life! Imagine the disbelief followed by a welling of hysterical laughter when I learned the publisher had pulled the plug on the book, less than one week before Jay Leno’s initial call! Now that is irony at its finest. I informed Jay about the issue and that rights would be rescinded to me. No problem. He offered to discuss this book, the book profiling the Checker Cab Manufacturing Companyhttp://rcm.amazon.com/e/cm?t=1968adventurer&o=1&p=8&l=bpl&asins=158388100X&fc1=000000&IS2=1&lt1=_blank&m=amazon&lc1=0000FF&bc1=000000&bg1=FFFFFF&f=ifr, or the long list of articles written for Cars & parts, Hemmings Classic Car, Old Cars Weekly, and Classic Auto Restorer. Now it was just a matter of getting our schedules to mesh. Not an easy matter as I have a real job that supports the writing habit and Ghost Towns of the Southwest, released in March, was requiring a great deal of attention in regards to promotion. At this point what I thought was a very surreal situation turned into a bizarre situation. The ghost town book sold out in a record 45 days, I had book signings scheduled for the next several weekends but the publisher wouldn’t have books for four to six weeks, and a book signing in California that coincided with a weekend that Jay was available was rescheduled to a date when he was out of town. Promotion, completion of a new book, the regular job, taking care of mother, and acceptance of a new contract kept me busy through the summer and compounded the scheduling issue. Then in September, Chris Durkin, my son, and I, decided it was time for the men to have a weekend road trip to L.A. before the arrival of my grandson scheduled for October. Even though it was a relatively spontaneous trip, a fruitless effort was made to see if Jay was available. Would you care to guess what happened? Jay Leno and the legendary Doble. Jay had a schedule change but we did not get the message. 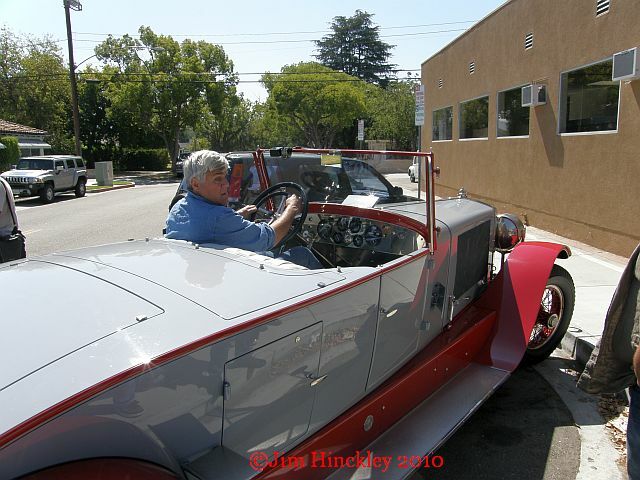 We arrived at my favorite book store in Burbank, a detour from our original plan to hit Santa Monica first, began looking at the vintage cars, including the Doble driven by Jay Leno who stopped by for a magazine, and sampling the excellent pastries. Now flip the clock ahead a few more weeks. The interview is set for November 20. On the 17th a postponed biopsy is done and skin cancer is confirmed. On the 19th I broke a tooth. On Saturday morning I popped a few Advil as we motored west to the Big Dog Garage and the end of a mind boggling adventure filled with more plot twists than a classic Hitchcock classic film. So, if you have ever wondered what a Hinckley sounds like, here is your opportunity. Check out this link on December 22.